Good Morning, this is Capital Essence’s Market Outlook (the technical analysis of financial markets) for Tuesday December 4, 2018. 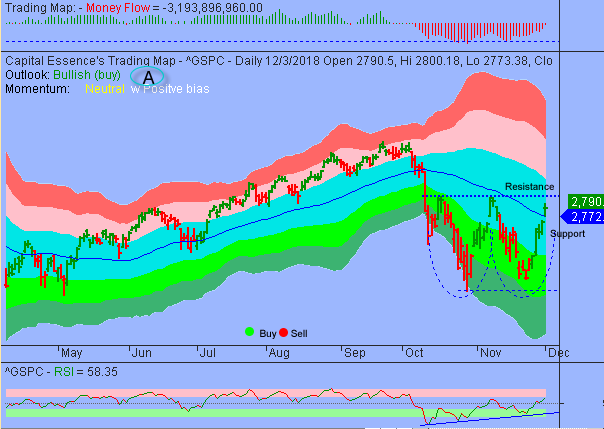 We’ve noted in the previous Market Outlook that: “there is a distinct possibility that a W-shape pattern is forming in the daily chart of the S&P. The pattern it is characterized by positive momentum that bode well for a breakout in the days ahead. We would add upside exposure once the S&P clears 2775 because it would affirm the buy signal that is in place per our proprietary indicators.” As anticipated, S&P extended last week’s rally by 1.1 percent Monday to close at 2,790.37 following report that Donald Trump and President Xi agreed at their Saturday dinner meeting to suspend further tariff actions for 90 days, during which time further negotiations will be conducted with an aim of trying to settle disagreements over structural trade issues. The Dow Jones Industrial Average rose 1.1 percent to 25,826.43. The Nasdaq Composite rose 1.5 percent to end the day at 7,441.51. The CBOE Volatility Index (VIX), widely considered the best gauge of fear in the market, fell 9 percent to 16.44. Energy stocks had a great day as WTI crude bounced 4.3% to $53.06/bbl. Contributing to crude’s advance was an upbeat growth perspective from the trade ceasefire and Canadian province Alberta’s decision to cut oil production by 325,000 barrels per day, or 8.7%, starting in January to help curtail excess supply. Separately, Qatar surprisingly announced plans to withdraw from OPEC to focus on gas production; Qatar has been a member of OPEC since 1961. The Energy Select Sector SPDR ETF (XLE) rose 2.2 percent on the day and is down more than 6 percent YTD, underperformed the S&P by a wide margin. Now the question is whether the rally is a beginning of a new upswing or it’s merely a dead cat bounce? Below is an update look at a trade in XLE. Our “U.S. Market Trading Map” painted XLE bars in red (sell) – see area ‘A’ in the chart. The first dominant feature on the chart is the falling trend line starting in early 2014. The second dominant feature of the chart is the sideways trend between 78 and 62 since September 2017. The October selloff found support near 64, or the 50% Fibonacci retracement of the 2016-2018 upswing. This week’s rally pushed the ETF above the October falling trend line, signify a bullish reversal. Nevertheless, the near-term technical bias remains bearish so rallies are counter trend bounces and should be sold. A close above 67 on a weekly basis has measured move 72-78. 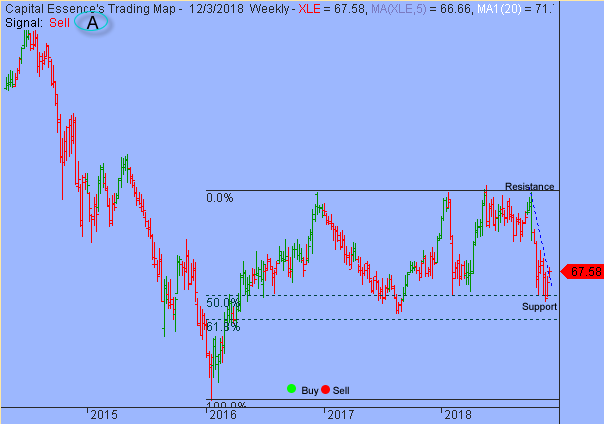 As for support, XLE has a strong band of support between 64 and 62. Short-term traders could use that level as the logical level to measure risk against. Key technical development in Monday session was a clear break above the trend channel moving average. That level was significant when the index fell below it in early October. This is a positive development, confirming last week’s bullish reversal signal. Over the next few days, the most important to watch is the trading action near 2815. As mentioned, there is a distinct possibility that a W-shape pattern is currently setting up in the daily chart of the S&P. This pattern is a formation comprising two lows separated by a peak. Those lows occurred in October 29 and November 23 at 2603 and 2631 respectively. The peak occurred in November 17 when the S&P hit an intraday high of 2815 then sold off. In the W-shape bottom, the S&P would have to move above 2815 and then use that level as the new support level for the uptrend rally continuation. Short-term trading range: 2760 to 2815. S&P has a strong band of support near 2770-2760. A close below that level has measured move to 2700. The index has resistance near 2815. A close above that level could trigger acceleration toward the 2900 zone. In summary, this week’s bullish breakout had helped putting the bulls back onto the driver side of the market but it doesn’t mean that we’re out of the woods. Over the next few days, we will look for trading behaviors as the S&P probes key technical resistance near 2815. The market had historically developed minor resistance near that level. There is no reason to turn particular bullish until this zone is eclipsed.